I just found out about this awesome weekly link up called “The Sunday Scoop!” Since my blog just got a makeover I am trying really hard to blog more and be consistent with it! This linky is hosted by Teaching Trio, if you head over there you can read about what other teacher bloggers are doing! So here it is my scoop for the week! Make Christmas lists for the kids! This year we have decided to do the 3 gifts for Christmas idea. Each of the 5 kids will get 3 gifts, something they need, something they want and something that is sentimental. I thought we would try something new this year as my kids are all getting older and we know sometimes that can mean more expensive items. My kids range in ages from grown up’s not living at home, to teens and then the tag along 7 year old! I am really looking forward to the sentimental gift the most I think. If you want to read more about the traditions behind this idea you can click here! Grocery shopping and the most dreaded weekly chore seem to get stuck with each week. Sigh…… I know first world problems and all but those jugs are so darn heavy. I think there is a conspiracy going on in my home because it almost always seems that no one is here to help bring them in. Laundry, it is never ending seriously enough said. 2 things I HOPE to do this week! Work on a math review product for my son’s math teacher. Each week my son goes to a different class for math practice. She needs something that combines a number of the day on one side and the other side basic review practices. She has 2 groups so I will need to make sure that I can cover concepts for both sets. It is 2nd grade so I will need to brush up on my skills lol! Get the kids clothes together to donate! My son went through some kind of massive growth spurt and grew 2 sizes over the summer. I am left with like 16 pair of super nice jeans that sadly don’t fit him anymore. I will be getting all of them together and donating to our local homeschool group. I think it is important to give back and so we find ways all throughout the year that we can bless others. Even when you think you don’t have much to give you would be surprised at how you can totally make someone’s day with your “little”. 1 thing I am HAPPY to do! Sit in front of my Christmas tree and relax. This year’s tree is a bit sentimental to me. We are thinking about moving in May of next year so one of my daughters who just turned 18 is thinking of staying behind and moving in with her older sister. Insert super sappy mom. Now I have two grown children one moved out when she went to ministry school at 17, and my son at 19 (although now he has moved back home) you would think I would be prepared for this kind of thing. Yeah no! It hit me like a ton of bricks when we were decorating this year and I cried like the biggest baby ever. My daughter kept trying to reassure me that she will come out every Thanksgiving so she can continue our day after decorating tradition. Wow! What a great post! I love your linkup this week. 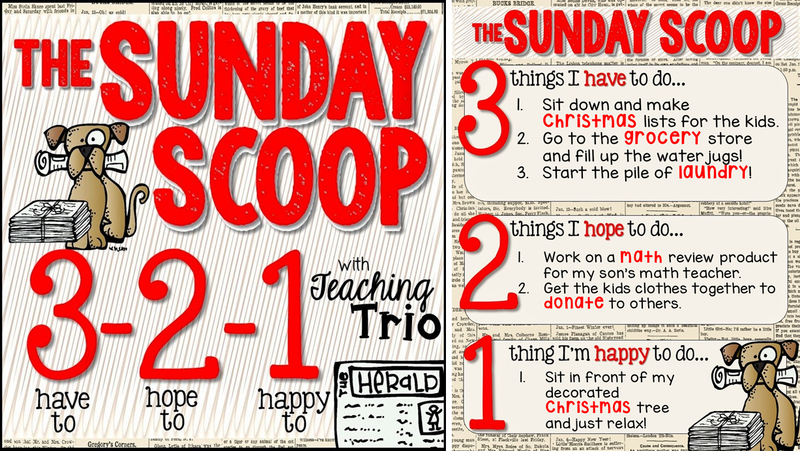 I hope you’ll be on more Sunday Scoop link ups! I have it on my calendar it is my goal to use my blog more! Sounds like you have lots to do! I’m starting to get teary eyed just thinking of my little ones leaving me. Traditions are so important. Enjoy and Relax! Thank you Marianna, I did enjoy my Sunday a little lol! That alarm came a little too quickly this morning!